This is a 10-page (plus cover & back), Kingsport Chamber of Commerce (A. B. Coleman, Executive Vice-President) piece from 1957. Its cover matches a 1948 one I have in all but color: the 1948 one has a green fill. 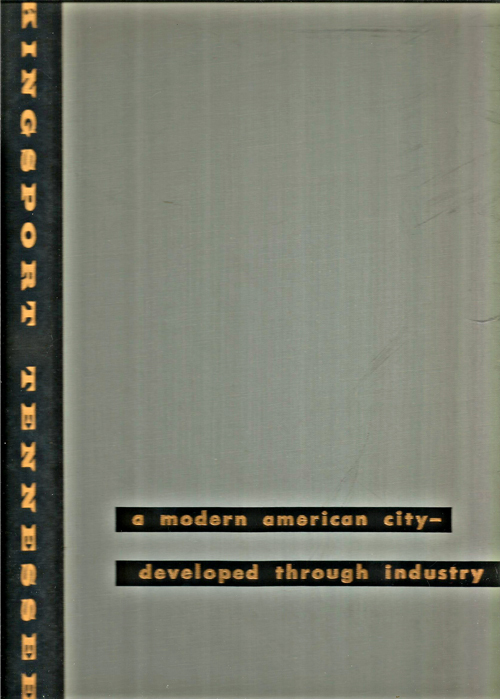 And the 1948 one was published by the Kingsport Rotary Club, this one was done by the Chamber. Ellis Binkley worked on both of them. Both printed by Franklin Printing Company (up on Main Street…it always smelled great, of paper, of ink…the same smell a newspaper building should have). Quite a few black-and-white photos in both of these…some duplicated, but others showing the passage of nine years. The 1948 issue has a map on the back cover. I never knew that Highway 11 (now the Robert E. Lee Highway)(Stone Drive, of course) was known as the “Broadway of America Highway”. Wikipedia neglects to mention this. Both pieces, though, are pretty much textbook promotion handouts for that post-war period. Remember, it’s said that Chicago isn’t called “The Windy City” because of its weather, but for its indefatigable promoters. This entry was posted in Bob's photos and tagged A. B. Coleman, Ellis Binkley, Franklin Printing Company, Highway 11 "Broadway of America Highway", Kingsport Chamber of Commerce, Kingsport Rotary Club, Kingsport TN on August 26, 2014 by Bob Lawrence.